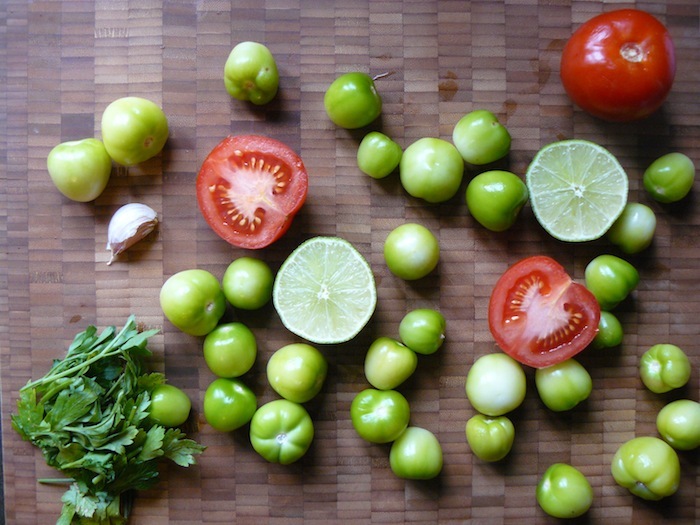 Tangy, Refreshing Red and Green Salsa (with Tomatillos and Tomatoes!) – Ashleigh Grange, R.H.N. I would be lying if I said I wasn’t already mourning the loss of the fruit and vegetable bounty that crops up during the warmer months. Easy and plentiful access to organic berries, organic kale and other greens, organic sweet peppers and celery, and of course – the juicy tomato! There is so much to love about summer produce in part because summer makes it easy to eat local, eat organic, eat in season and eat healthier overall. That’s my kind of eating, oh yea! And it honestly takes every ounce of willpower I have not to stuff my face with local fresh fruits and vegetables when they’re perfectly ripe and in season. Yes, I feel that strongly about my fruits and vegetables. Hopefully you do too? If you’ve never seen or eaten tomatillos, behold these fabulous green orbs. Don’t they have a lovely charm to them? The tomatillos above are naked… but let’s not get x-rated: they’ve simply been relieved of their papery, thin husks. As tomatillos ripen, the fruit fattens until it gets too big for its jacket and then splits open, signalling to us that it’s ready for picking (and eating!) I believe that nature will let you know when it’s good enough to eat. 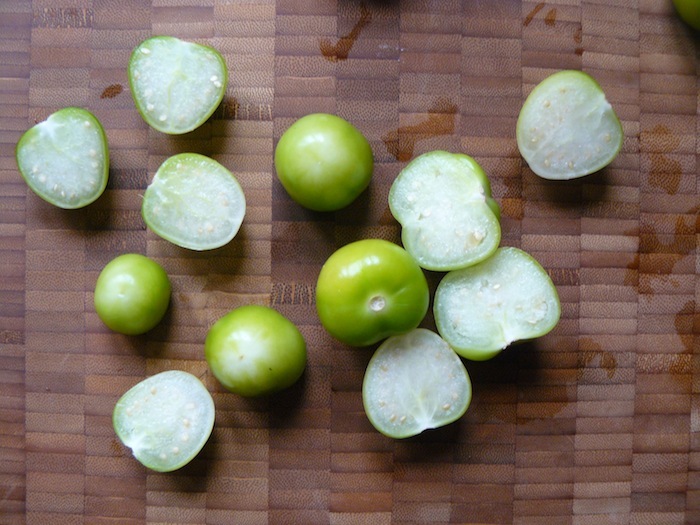 Full of potassium and vitamin C, tomatillos are very tart, refreshing and crisp. Some say they taste like apple, citrus, pear or cucumber. Clearly there is some debate. In any case, they sure don’t taste like an unripe green tomato! These babies have a flavour that is all their own. Here I’ve married these fun tomatillos with fresh garlic, fresh parsley, fresh lime juice, olive oil, apple cider vinegar (which I’ve studied lately for its reputation as a blood sugar stabilizer), ground cumin and cayenne, and a small amount of ripe, red tomatoes because they were left over from a meal I made earlier in the week, and because I loved the idea of contrasting colours in a traditionally green salsa. You’ll be happy to know that making a fresh homemade salsa couldn’t be easier: just chop, blend and season… let’s never forget the salt, friends. It helps every dish’s true flavours shine through. Chop all ingredients by hand and mix together. Or, for a faster but finer and smoother texture, combine all ingredients in a food processor and pulse until you are satisfied with the texture. 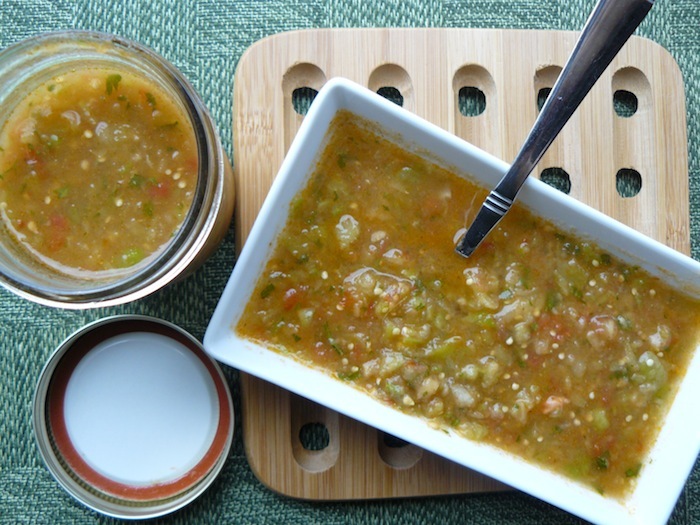 Enjoy this fresh salsa in every which way. Serve with fresh veggies, homemade crackers, kale chips, on baked eggs, or whatever else needs a full-on, kick-in-the-pants flavour boost! 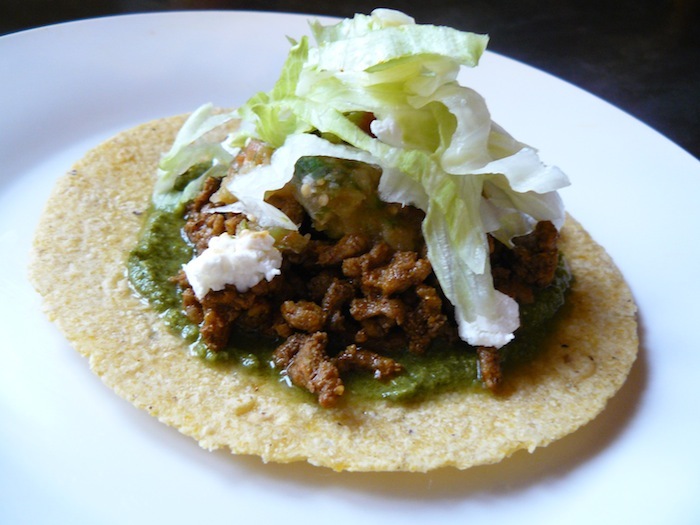 You might even serve this on tacos like I did. This might give a traditional salsa verde a run for its money. What do you think? Do you ever make homemade salsa? What do you love to eat it with? Let me know below! 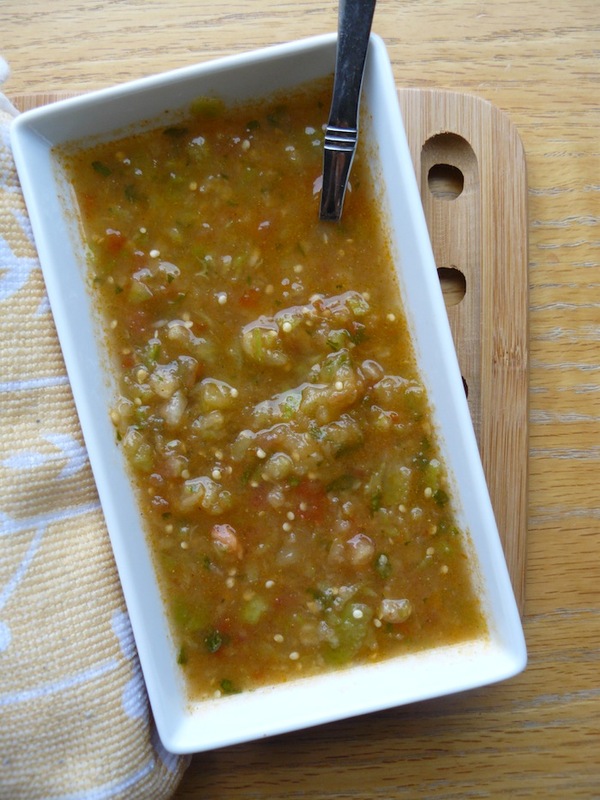 This entry was posted in Condiments & Sauces, Local Food, Recipes and tagged condiments, fall, gluten-free, salsa, summer, tomatillos, tomatoes, vegan friendly. How to Reach Your Health Goals Using One Simple Tool (Read this and grab your free templates)!